Blue Art Silk Lehenga Choli. The art silk lehenga is beautifully weaved together with resham and zari dori, matte sequins intricate embroidery work. 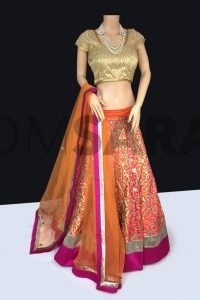 The lehenga set comes with art silk embroidery choli with cold shoulder and a embroidered soft net dupatta.